If you asked us what the teaser trailer for Ace Combat 7: Skies Unknown's season pass would look like, we'd probably say a minute or so of footage showing dogfighting, explosions, and a sprinkling of story hints. What we actually have is the above, a rather unusual video that doesn't really have any of that. Okay, so it probably does hint at story elements in the upcoming DLC missions, but with such little context, it's difficult to know what it really means. We're sure Ace Combat super fans will be able to piece together more information, but right now, we're not sure what this points towards. We do know, however, that the AC7 season pass is set to include three new planes, three new missions, and a music player mode that lets you play back all the songs from the game. 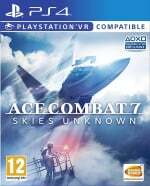 Are you looking forward to Ace Combat 7's season pass content? Take to the skies in the comments below. I have absolutely no idea what that means! But its yet its more Ace Combat content and thats ultimately a good thing. I wonder if it’ll link to AC3 in any way?